Earlier this year When I read that the Yorkshire Sculpture Park was going to show works by Yinka Shonibare MBE I wasn’t that fussed. I’m not sure why. Maybe it was because I had never heard of Shonibare. Maybe it was the photo of a fox in a suit, holding a gun. Whatever the reason, I only got round to seeing FABRIC-ATION today, almost 3 months after it opened. I can’t believe I almost missed seeing this gem. It’s dazzling. Sonibare’s work encompasses not just sculpture, but painting, collage and film as well, and his exhibition extends across the sculpture park. All I managed to see today were the sculptures and paintings in the Underground Gallery, and in the grounds immediately outside. But what I saw was so rich, so vibrant, and so thought-provoking I didn’t want to move on to anything else until I’d digested what I’d seen. 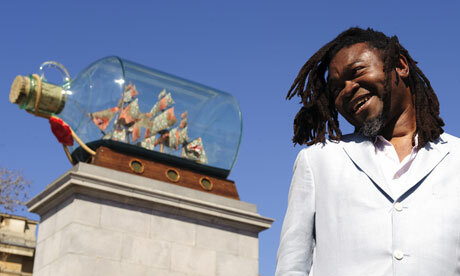 Yinka Shonibare MBE was born in London in 1962, moved to Nigeria when he was three, later returning to the UK to study art. If his name rings a bell it may be because he was one of the artists to provide a public work of art for the Fourth Plinth in Trafalgar Square, London (the maquette for which is displayed elsewhere in the Park). FABRIC-ATION features over 30 works from 2002 – 2013, including two major commissions, Wind Sculptures (2013), which are premiered here. Wind Sculpture II sits at the top of the park with a grand view over the valley to the wind turbines on the hills opposite. Painted with what I’ve learned is Shonibare’s signature batik-inspired surface pattern, these sculptures appear fluid like fabric caught by the breeze, but are made from fibreglass. 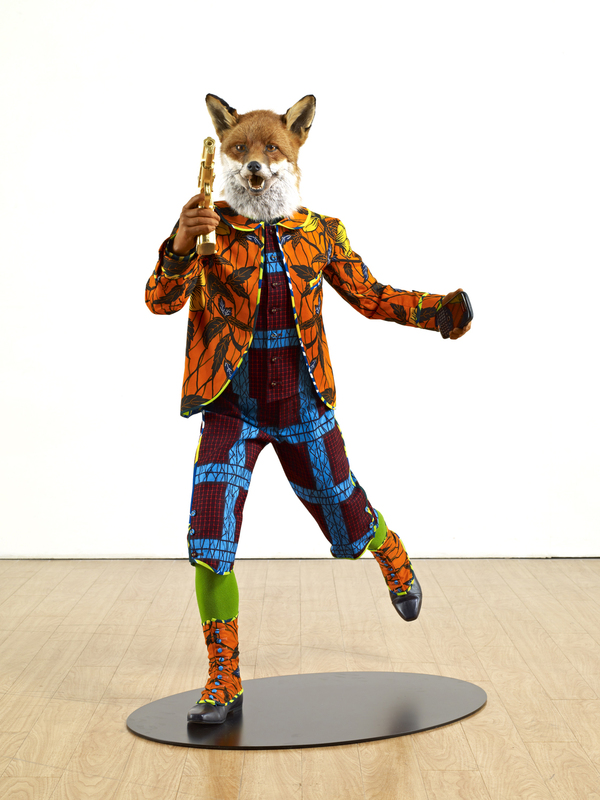 His sculptures in the gallery also use vibrant batik-like prints in costumes, often incongrously to make a statement. These are so beautifully rich that it takes a while just to absorb the first impression of the sculptures, before even understanding what they are speaking to us. Look beyond the busy colour and there is a real simplicity of message – we receive it loud and clear. In Revolution Kids (2012), as a response to the riots in England and the Arab Spring Shonibare has created half-human, half-animal embodiments of a bold, insurrectionist spirit, waving replicas of Colonel Gaddafi’s golden gun and carrying the obligatory Blackberry. 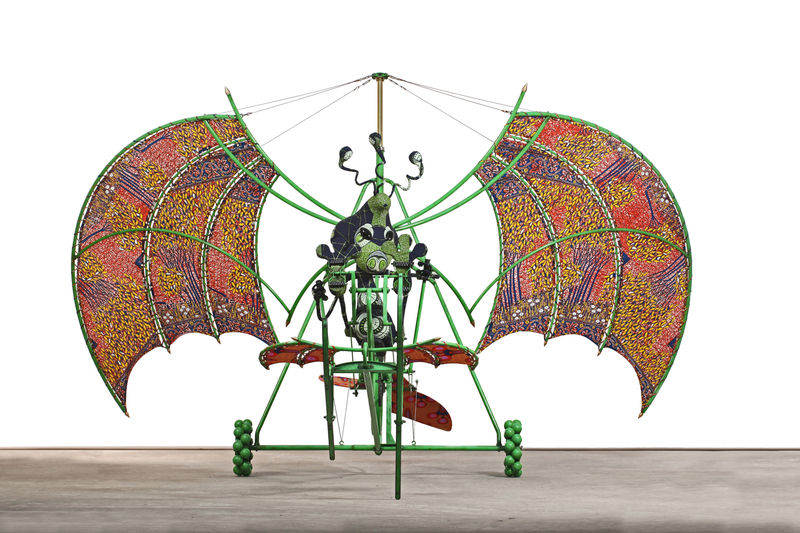 And in the Flying Machine sculptures (2012) cute-looking fabric-skinned aliens steer Da Vinci-esque flying machines, highlighting how ‘alien’ should be non-threatening, and showing how old-fashioned attitudes to ‘the other’ can be. It’s a great exhibition, captivating, colourful and inspiring. There’s a lot to take in. Once I’d seen just a handful of his pieces in the concourse of the Underground Gallery my head was full of “wow” and connections and inspiration. I could have left then, satisfied with what I had seen. But his sculptures are so full of life I felt drawn into the rooms in spite of myself. He’s a very clever man. If you want to see it for yourself, it’s on until 1 September 2013. If you can only visit once make sure you have plenty of time to visit all Shonibare works and to absorb them. I’ll be going back to see the bits I missed, and to spend some more time in the Underground Gallery while I still have chance to step into the dazzling world of Yinka Shonibare MBE. This entry was posted in Public sculpture, Sculpture and tagged FABRI-CATION, Flying Machine, Revolution Kids, Shonibare, Wind Sculptures, Yinka Shonibare MBE, Yorkshire Sculpture Park. Bookmark the permalink.